Where are African voices in support of human rights defenders? Earlier in November, Norway introduced a draft resolution on the protection of human rights defenders at the UN General Assembly. This important draft text was tabled at a time of shrinking civil society space in many parts of the world and against a backdrop of an increasingly threatening climate for human rights defenders. Unfortunately the draft resolution has become subject to an increasingly wide range of amendments designed to weaken the text and undo previously agreed language. Many of those amendments have been tabled by the African Group. Why would Africa, where civil society plays an important and increasingly dynamic role in the region’s democratic life, choose to table such amendments? 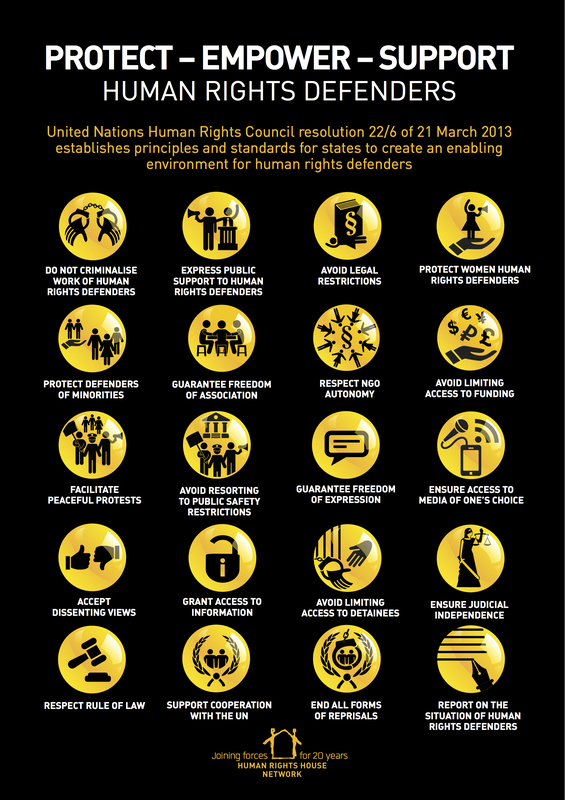 The proposed resolution addresses several issues that will strengthen the protection of human rights defenders. Before such a text can be adopted, it is quite normal for it to be subjected to long and detailed negotiations. All States logically defend their interests in such negotiations. However, in the case of the current draft resolution, there is a clear sense that some States are trying to unpick or challenging existing norms, as a way of reducing international scrutiny of their domestic policies and practices. It is worth noting, in this regard, that the protection of human rights defenders has been an important issue at the UN since 9th December 1998, when the GA adopted the Declaration on human rights defenders, asserting the right of anybody to defend all human rights of all people. Some of the amendments proposed this year, risk undoing normative progress achieved since that time. All this makes the position of the African Group on the draft text both surprising and troubling. In amendments to the revised draft, the African Group is, for example, opposing wording that condemns violence against human rights defenders. One of the African Group’s amendments suggests deleting any reference to violence against human rights defenders, criminalisation of their work, and the torture, disappearance, killing and (thus) the silencing of human rights defenders. In another amendment, the African Group proposes to delete a proposed UN call for the release of persons detained or imprisoned for exercising their human rights and fundamental freedoms. The African Group is yet to explain why it believes individuals in any part of the world should be detained because of their human rights work. 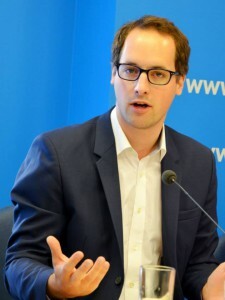 Moreover, in another amendment, the African Group suggests deleting any call for States to ensure that procedural safeguards are in place to avoid the use of unreliable evidence, unwarranted investigations and procedural delays, thereby effectively contributing to the expeditious closing of unsubstantiated legal cases against human rights defenders. This is a basic preventive call against discriminatory practices vis-à-vis human rights defenders, on the part of those who hold police and judicial power. Further amendments seek to delete any condemnation of the use of social media to insult, verbally abuse or threaten human rights defenders; and to delete all references to the family members, associates and legal representatives of human rights defenders. On the latter point, it should be recalled that the relatives of human rights defenders are vulnerable to threats, loss of employment, and violence, as a form of retaliation for the human rights work of their relatives. Human rights lawyers are in a particularly dire situation, as we recently documented in a report on the subject. These are just a few examples of the amendments tabled. During the negotiation process, Africa, unlike any other regional group, was represented by only one State: Egypt. Many NGO observers have expressed surprise that the position presented by Egypt can be truly representative of the views of the entirety of the countries of Africa. Does Tunisia really believe the UN should not condemn the impunity of those attacking human rights defenders? Does South Africa believe that the UN should not urge States to fight discrimination against human rights defenders on the basis of race, colour or gender? Does Botswana feel represented by a group position that seeks to strike out language calling for the release of arbitrarily detained human rights defenders? It is time for the international community to clearly and strongly voice its concern when it comes to violence against and the criminalisation of human rights defenders, shrinking civil society space and a wider regression of the right to exercise fundamental freedoms. And, in that regard, it is surely time for the many countries of Africa that believe in human rights and the work of human rights defenders to step forward and make their voices heard. 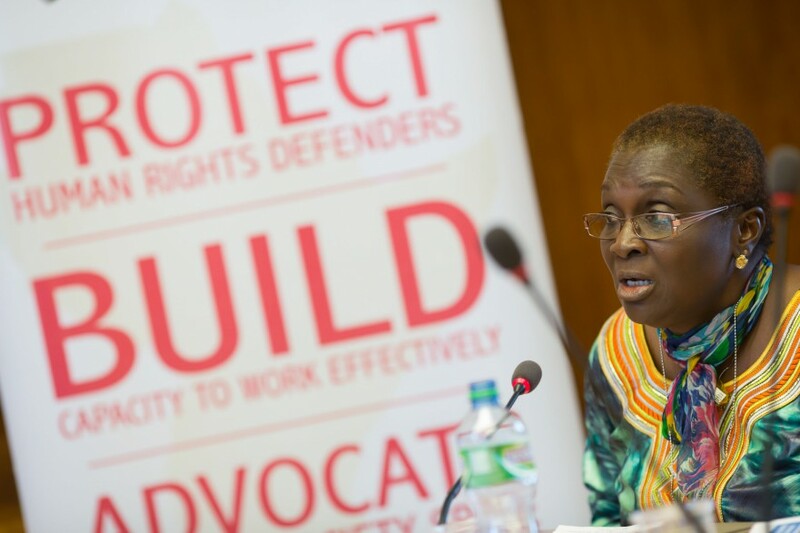 Image: “The African Commission on Human and People’s Rights Special Rapporteur on Human Rights Defenders, Reine Alapini-Gansou, speaks during the Africa side event on June 16” by Maina Kiai, licensed under CC BY 2.0.